Christmas is my favorite time of year. I love the sparkling lights, the smell of balsam and eucalyptus, and I’m a sucker for Christmas music. I also love all the gatherings and social good times that pop up during the season. Yet for all of this goodness, there are also packages to mail and people to shop for and the general hurry scurry that goes hand in hand with the holidays. It’s been a busy few weeks, but I wanted to make sure that I had some sweet treats on hand to help round out the packages I’ve been mailing out. For the package I sent to my dad, I wanted to include these little coconut bites because they reminded me of the coconut chocolate bars that my dad would buy for me and my brother at the corner store when we were kids. It was my dad’s favorite chocolate bar and while it did have a different name and packaging when I was growing up, it turned up in the 90s as a Bounty bar. Each chocolate bar contained 2 equal pieces so it was the perfect bar to share with my brother. This candy is the perfect memory maker as it tastes just like the candy bar of my youth. And because I’m a sucker for an Almond Joy, I decided to tuck in a roasted almond into each ball to make each bite extra special. It’s a great candy to make for the holidays because it uses just a few simple ingredients it’s way easier to make than you’d imagine. Looking for more holiday inspiration? Have no fear, my archives are here! Peanut Brittle is not only tasty but it’s a cinch, even for the most novice candy-maker. Last December I was much more prepared in the holiday department and not only created a huge list of tasty holiday baking but I included a printable gift tag for use with all your holiday baking gifts. Have the happiest of holidays! elsewhere: At Poppytalk, I make a delicious and easy fruit and nut chocolate bark. I make it every single Christmas and it’s a true favorite. Enjoy! In a medium bowl, combine the coconut with the sweetened condensed milk. Put in the fridge for 1 hour. Scoop the chilled coconut mixture with a teaspoon and use your hands to roll into balls. This amount should make 14 balls. Tuck an almond into each ball and re-roll so that the almond is hidden. Chill in the fridge. 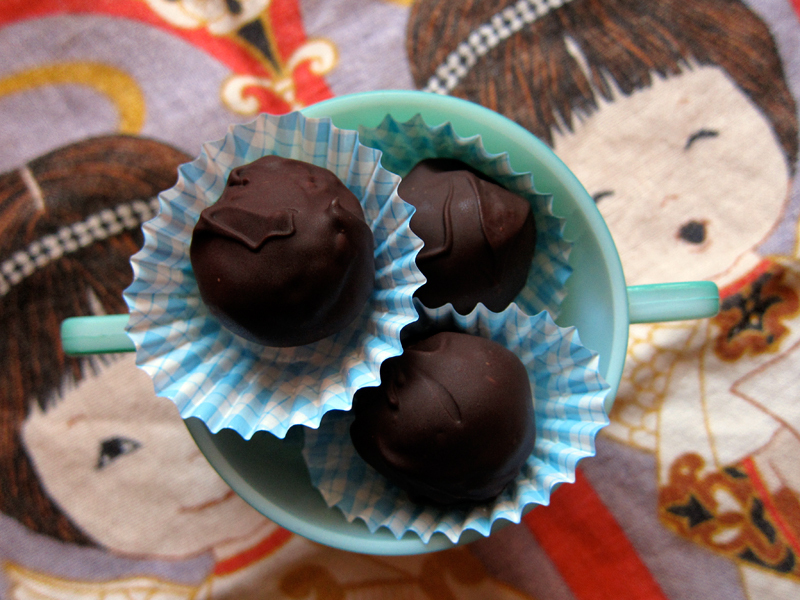 Melt chocolate using a microwave, a bain-marie or using a double boiler. Remove from heat and dip the chilled coconut balls into the chocolate mixture (I found using 2 teaspoons was helpful for this). Place on a cookie sheet lined with waxed paper or silpat and chill for 2 hours or overnight. 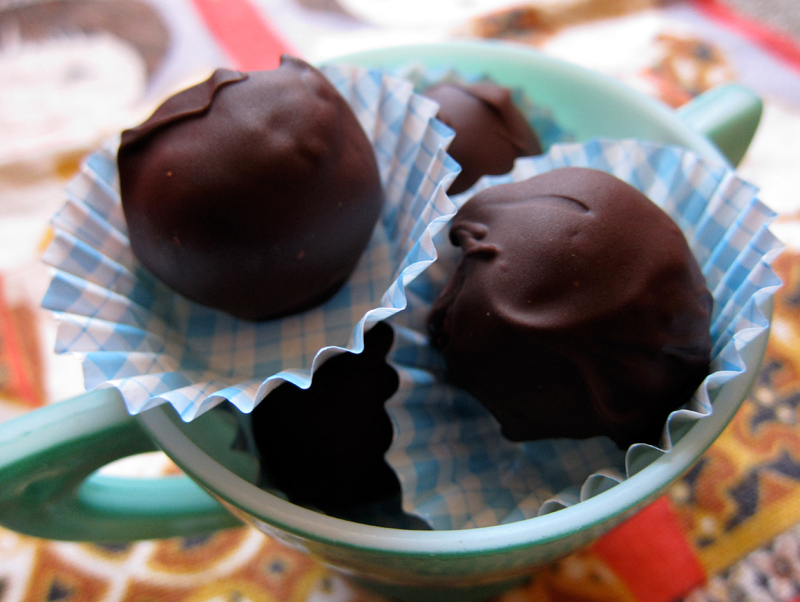 I love coconut and chocolate…these tasty treats look good and look easy to make! Thanks for sharing… I am sure your dad will love them. I remember that coconut bar from yesteryear…I just can’t recall it’s name. And great Christmas music mix…especially the Leadbelly! Merry Christmas! I love your cupcake liners that you used for wrappers, ADORABLE! Hag, me neither! The name has me stumped though I can remember the packaging – grey and brown and papery. Weird. Glad you liked the mix too 🙂 Merry Christmas! Redmenace, I’m sure soon enough, this will be your favorite time of year! It’s easy to roll out perfectly, really. No special skills needed. Thanks Six Balloons, it was a good vintage tea towel find! Emily, they are candy wrappers that I found at the Japanese dollar store. Cute, eh? Can you believe I’ve never eaten an Almond Joy bar? Nor have I eaten more than a bite of a Snickers bar, but that’s another story. I often crave all of these flavors, so if I could have it all in one mouthful… whoa. I’ve found a New Year’s project! I think I remember that coconut chocolate bar that came in two pieces. I think it was called Peter Paul’s Almond Joy. There was even a commercial that I loved singing as a kid… “sometimes I feel like nut, sometimes I don’t”…there were two versions of this confection, one with almonds and one without. Did this bar have a predecessor? These looks delicious!! I love coconut and chocolate and almonds! Oh man! Your Christmas mixtape is the best! Many thanks! Your rum ball recipe is an absolute requirement now during our holidays. Third year now is it? Good heavens, time flies! I just made these as one last Christmas treat thinking I had everything… but I didn’t. Missing almonds. Used cashews instead and still fantastic! Thanks! These are lovely! And with so few ingredients and and easy method they’re the perfect candy/cookie for a Christmas exchange. Thanks for sharing and merry merry! 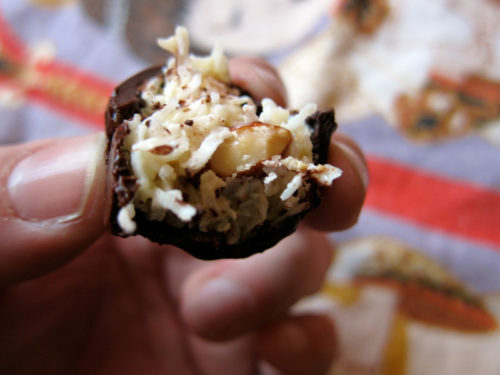 Chocolate+coconut+almond sounds heavenly. Must make these! Thank you for all your wonderful recipes, looking forward to more in the new year. Happy holidays! Thanks Heather, here’s to new chocolate projects! Bijoux, it wasn’t called an Almond Joy – there was a predecessor. It could have been called something as lame as a Coconut Tropical Bar, but I’m not sure! Someone sang that jingle to me this year… I never had cable growing up so it must have been an American jingle (never heard it before). Thanks Amelia! I’m glad to hear that the rum balls have become your family favorite. Hooray! Krissy, with cashews they’d still be fabulous! Thanks Beth! Merry merry to you too! These were so easy and taste fantastic! I made the coconut mix last night, and dipped them this morning, and am now taking them to work. Thank you for a great last minute treat! Gaile, so glad you loved them! Mmmmm. . . I’m definitely saving this one for next year’s Christmas treats! I just discovered your blog via Simple Bites. Thanks for stopping by Shelley! These were divine…thanks again for always sending us your sweet treats for the holidays. I looove Bounty bars so you can imagine how good these sound to me!! Yum. Oh my…if I made these as holiday gifts, I don’t think they would get past me. Almond Joys were always my favorite as a kid, which every other kid thought was gross.